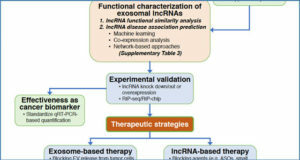 Long non-coding RNAs (lncRNA), a class of non-coding RNA molecules recently identified largely due to the efforts of FANTOM, and later GENCODE and ENCODE consortia, have been a subject of intense investigation in the past decade. 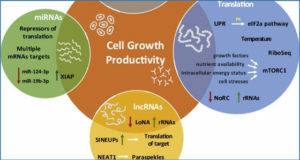 Extensive efforts to get deeper understanding of lncRNA biology have yielded evidence of their diverse structural and regulatory roles in protecting chromosome integrity, maintaining genomic architecture, X chromosome inactivation, imprinting, transcription, translation and epigenetic regulation. 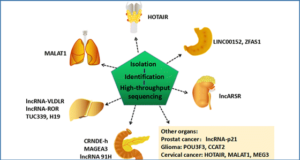 Here researchers from OPKO Health briefly review the recent studies in the field of lncRNA biology focusing mostly on mammalian species and discuss their therapeutic implications. A—Gene duplication and repurposing of pseudogenes is one of the proposed routes of lncRNA evolution. B—Mobile genetic elements (MGE) frequently initiate formation and evolution of new transcriptional units (TU) some of which become lncRNA. 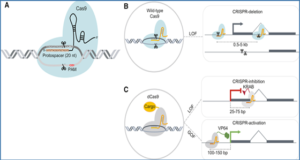 C—lncRNA participate in long range DNA looping essential for transcription regulation in somce loci. D—lncRNA are essential for telomere maintenance. 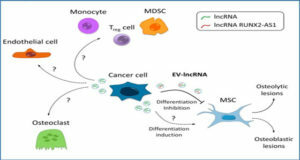 E—lncRNA participate in X-chromosome inactivation and imprinting. F—lncRNA scaffold and regulate formation of nuclear paraspeckles, as a result also controlling the nuclear-cytoplasmic transport of mRNA. G—lncRNA are involved in formation of interchromatin granules enabling pre-mRNA splicing and maturation. H—Fine regulation of epigenetic modifications is assisted by tethering of epigenetic effectors and formation of polycomb bodies by lncRNA. 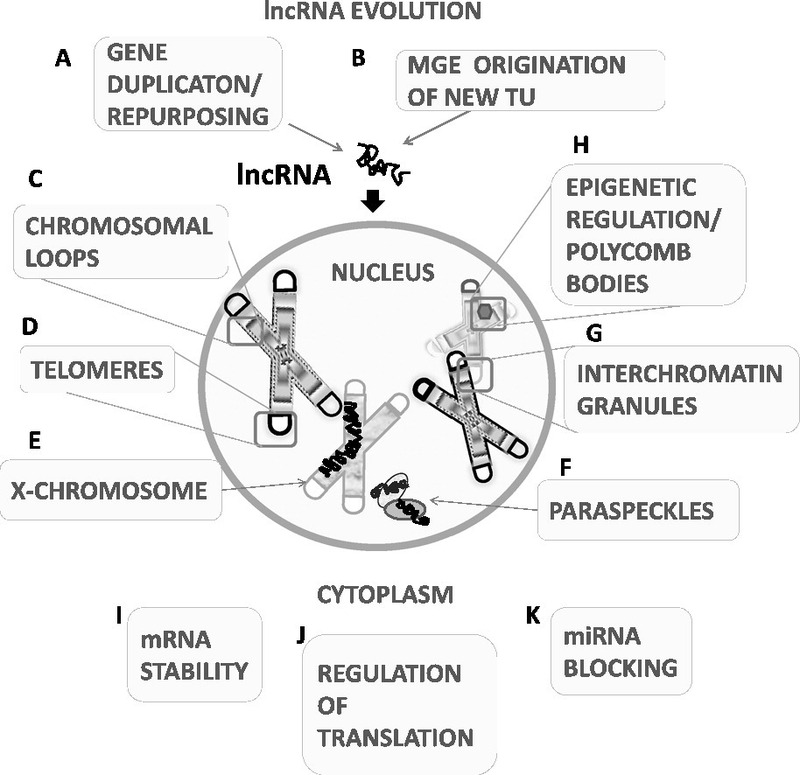 I—Cytoplasmic roles of lncRNA include positive and negative regulation of mRNA stability. 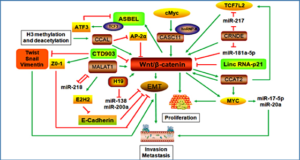 J—lncRNA are involved in regulation of translation and positive and negative regulation of nascent protein stability. K—lncRNA act as miRNA sponges blocking miRNA activity.